This "documentary novel" is actually a nonfiction story in verse, told in free verse poetry in the alternating perspectives of Mildred and Richard Loving. It begins in childhood, when Richard was an older neighborhood boy who hung around with Mildred's older brothers. These early interactions quickly set the stage for their eventual romance, marriage, and lengthy court battle to have their marriage legally recognized in their home state of Virginia. 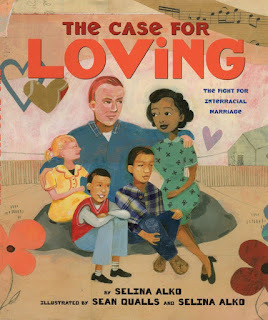 It may be shocking for today's young readers to realize how recently such interracial relationships were against the law (Alabama's anti-miscegenation law was reversed in the year 2000), and the book does a great job of conveying how much this law took a toll on the Lovings and their family. One nitpick is that I wish that the book had included original photographs of the Lovings themselves in addition to the drawings and other contemporary photographs (such as the photograph the picture book covered was based on). Seeing the Lovings as real people in a real image just helps bring their story home even more. I know the picture book, will read this documentary one as soon as I can. Thanks for sharing some details about it, Katie. I look forward to hearing what you think, Linda! I know it's not ideal from the publishers' perspective but I love when two books about the same topic come out close together. It's so fascinating to compare and contrast how different authors approach the same subject. Agreed. And the audiences are so different here (middle-younger elementary vs. young adult), that it's also interesting to see how each author "slants" the story too. You and Aly were on the same page today! 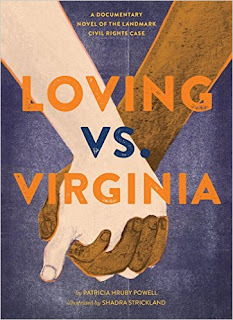 I read The Case for Loving for Multicultural Children's Book Day, and have Loving vs Virginia on my shelf waiting to be read. Although I liked the illustrations very much, I agree that the picture book should have has a least some photographs.